Eric Lam is yet another of the many "Curing Cancer with Photoshop" researchers which PubPeer is full of. This professor of molecular Oncology at Imperial College in London is responsible for several papers with duplicated gel bands, but does it matter? He has 250 more. Another instalment from the series “Curing Cancer with Photoshop“. This time, the hero is Eric Lam, breast cancer researcher and professor of molecular Oncology at Imperial College in London. Lam’s lab consists by his own count of “12-18 researchers”, Imperial had to stress that it “is made up from 15 females”. However, a number of problematic papers from Lam lab have male first authors. This cancer fighting hub at Imperial is funded by British national funders Medical Research Council (MRC), Cancer Research UK and Biotechnology and Biological Sciences Research Council (BBSRC). Major research focus is on the Forkhead Box proteins, in particular FOXM1, a transcription factor implicated in cancer development. A pedestrian approach many cancer researchers take, where similar-looking papers on slightly varying topics of the same gene are produced, none of them too unorthodox or earth-shattering to attract scrutiny as to how those results came to be. Lam’s science is not controversial for that, and with 250 papers it is the combined quantity and mediocrity which let his research stand unquestioned. Yet if one does look closely, as the data integrity sleuth Clare Francis did and posted it on PubPeer, one finds duplicated western blot bands and irregularly spliced gels. Maybe it is a novel molecular pathway of FOX proteins, to be harnessed for a cancer cure? What this article shows, is actually nothing scandalous. It is simply the boring banality of bad science in cancer research which PubPeer is full of. Lam is just one of many successful academic oncologists who knows what is needed to successfully publish papers in respectable society journals. We can start with an early work from Lam lab, where Sunters et al J Biol Chem 2003 proved that FOXO3a and FOXO1a proteins are involved in apoptosis of cancer cells treated with a chemotherapeutic agent. Not really a surprising result, under the circumstances, but it still needed some tweaking. In a certain cancer cell line, this paclitaxel treatment had a bizarre effect of duplicating, or even triplicating gel bands inside the loading control. Apparently, an extracellular Photoshop-defence mechanism against undesired results gets activated, which then provides FOXO3a and FOXO1a phosphorylation in a tubulin-western blot band-dependent matter. Amazing science at the forefront of war on cancer at Imperial. The Fernandez De Mattos et al, Mol Cancer Ther, 2008 paper from the Lam lab is also an interesting example in this regard. Who would have expected that the chemotherapeutic agent cisplatin will not only reduce the phosphorylation of FOXO3a protein, but also lead to a duplication of a p-FOXO3a gel band? Serendipitous discoveries like this is what drives cancer research! Or this paper Francis et al, Int J Oncology, 2009, where Lam found out the key role of FOXM1 in breast cancer. The effect is that universal, that cancer cell lines produce identical western blots even when treated with utterly different pharmacological inhibitors, and in different publications. 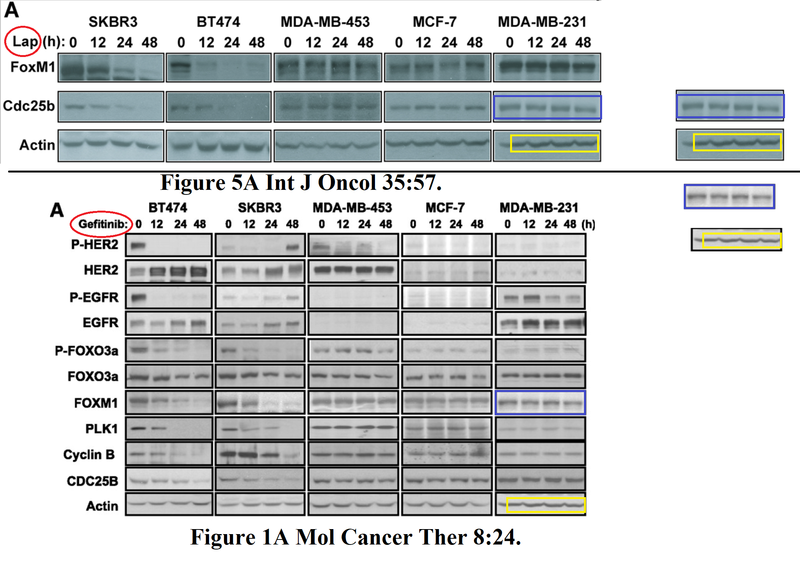 This is why two western blot panels from that paper are found in Mc Govern et al, Mol Cancer Ther, 2009, another Lam paper published by American Association for Cancer Research (AACR). The effect spreads even further inside the McGovern et al 2009 paper. 4 loading controls were re-used, but not the fifth one because it apparently already was delegated to moonlight in the parallel Francis et al 2009 paper. The following Lam study gives insights into his mentorship practice. Jimmy Kwok did his PhD udner Lam and is now head of London oncology division with the private healthcare provider HCA Healthcare UK. He is also a registered Ashtanga yoga instructor and helps cancer patients by selling them his books on yoga. There is lots for Kwok to mediate on himself though, for example on his paper Kwok et al Mol Cancer Research 2010 and his PhD thesis from same year. Can yoga explain that western blot bands showing the expression of an oncogene look identical between control and chemotherapeutic agent-treated cells? Especially that these gels bands were squeezed vertically to look smaller when the therapy began? This was what Lam published together with another Imperial colleague, Simon Wagner (who is now with University of Leicester). The paper Batlle et al Mol Immunology 2009, published with Elsevier, proves that in the end, anything goes and nothing matters. Nobody cares, or looks, or actually peer reviews. Some brightness touch-up suffices to make results from different experiments interchangeable inside the same figure. Leukaemia solved, the easy Imperial way. Other concerns in Lam’s papers are hidden irregular gel splicing, mismatching loading controls, which both make western blot results rather unreliable, or occasional duplications like in Barnouin et al J Biol Chem 2002. The bigger problem is that in cancer research, all these issues in Lam’s papers are nothing special. None of them. Those problematic western blots Lam published are boringly common. Just in UK, there are many other cases of photoshopped cancer research discussed on PubPeer, my site alone documents ICR London, Cardiff University , or even another lab at Imperial. Even more, Lam’s own superior Iain McNeish, Head of Division of Cancer of Department of Surgery and Cancer at Imperial published something rather inappropriate in his own youth, also at Imperial, in McNeish et al, Cancer Gene Ther, 2001. This is just one example of duplicated gel bands in that paper of his, more is on PubPeer. Even more can be found on PubPeer in the works in of McNeish et al 2001 last author, Nick Lemoine, formerly professor of molecular pathology at Imperial and now Chair of the Bart’s Cancer Institute in London. That was also mostly posted by pseudonymous sleuth Clare Francis, who also informed the universities involved. Not that anyone cares, just like with ICR, also on Bart’s case it will the institute director investigating himself. Lemoine is also Chair of trustees at MRC, in case anyone is concerned about MRC’s attitude to research integrity, they can complain to Professor Lemoine. It is basically a culture of mutual back-scratching and one hand washes the other in cancer research. Lam might be not the biggest shark in the pond, but one quickly sees that those above him and at the helm of British cancer research are, let’s put it this way, conflicted themselves. Yet this kind of bad science quickly leads to clinical trials, with millions of pounds, dollars or euros wasted, where thousands of cancer patients are given false hope and subjected to potentially dangerous therapies based on a flimsy, unreliable or plain fake lab data. Those same people unable to present a convincing western blot without the help of Photoshop, keep asking the public to donate to cancer research. Maybe this is why there is so little progress relative to the enormous financial effort worldwide. What if the really radical approach to war on cancer would be not throwing good money after bad in Moonshot programmes, not inventing new crazy theories of cancer, not stripping patients of basic protection so new methods can be quickly tested on them on a hunch, but introducing some basic research integrity for a change? It would cost very little, in fact it would liberate enormous sums which more honest scientists could use for better science. According to Prof Lam, the above western blot band duplications were done “for the women suffering for breast cancer”. Image: @ImperialCR_UK, on Twitter. Update 25.11.2018. Same day and just a couple of hours after this article appeared, Lam’s Head of Department Iain McNeish went to PubPeer to share the results of an investigation on his own problematic paper with Nick Lemoine, in this comment. In brief, the gel band duplications were confirmed and original data was not available. This was exactly the reason why Imperial and Bart’s Cancer Institute decided not to retract or even to correct the paper. And anyway, some of the duplicated bands were, as McNeish said, “only control lanes”. McNeish announced to be now in charge of monitoring and punishing exactly same transgressions as his own paper shows. In Britain, goats are appointed gardeners, by other goats. “None of these issues in my opinion change the conclusions made in the papers. I see no merit in retracting these important publications or publishing an erratum at this late stage, although agree that there have been errors made in producing the figures. It should also be noted that the original data was no longer available for review. […] The investigation stated that the conclusions made from the published studies were valid and important, even accounting for these reporting errors. I keep insisting that should be compulsory publishing the original data and that funding agencies should not be happy to invest in any research proposal unless they have solid evidence regarding raw data. the ¶¶Department of Cancer Studies and Molecular Medicine, University of Leicester, Leicester LE1 7RH, United Kingdom. One way to look at it is that Imperial is proud of the high proportion of women employed. the vast majority of cases of breast cancer are in women. A more cynical way of looking at it is “look like you donors”. Eric Lam is a man, but most of the other people in the lab are women. Apologies for “binary”, but that is how the data are collected and published. Has the Imperial College in London been informed? Will they start an investigation? especially those that have an unlikely good publication record, like e.g. Dr Lam. “especially those that have an unlikely good publication record”. Many of the 1500 are reviews, same old same old. Caught in somebody else’s retraction. No alarm bells ringing at Imperial? The reality. The ones in the middle of this list are the worst. Same research theme as Prof Peter J Barnes, is Prof Kian Fan Chung. Perry MM1, Tildy B2, Papi A3, Casolari P3, Caramori G4, Rempel KL5, Halayko AJ5, Adcock I2, Chung KF2. School of Pharmacy & Biomedical Sciences, University of Portsmouth, St. Michael’s Building, White Swan Road, Portsmouth, PO1 2DT, UK. mark.perry@port.ac.uk. Airways Disease, National Heart and Lung Institute, Imperial College, London & Royal Brompton NIHR Biomedical Research Unit, London, SW3 6LY, UK. Sezione di Medicina Interna e Cardiorespiratoria, Centro Interdipartimentale per lo Studio delle Malattie Infiammatorie delle Vie Aeree e Patologie Fumo-Correlate (CEMICEF, formerly termed Centro di Ricerca su Asma e BPCO), Università di Ferrara, Ferrara, Italy. Unità Operativa Complessa di Pneumologia, Dipartimento di Scienze Biomediche, Odontoiatriche e delle Immagini Morfologiche e Funzionali (BIOMORF), Università degli Studi di Messina, Messina, Italy. Departments of Internal Medicine & Physiology, Respiratory Hospital, Sherbrook Street, Winnipeg, MB, R3A 1R9, Canada. Hydrogen sulfide inhibits proliferation and release of IL-8 from human airway smooth muscle cells. Perry MM1, Hui CK, Whiteman M, Wood ME, Adcock I, Kirkham P, Michaeloudes C, Chung KF. Experimental Studies, National Heart and Lung Institute, Imperial College London, London, United Kingdom. Problematic data Prof Kian Fan Chung, and Prof Ian Adcock. Professors Ian M. Adcock, Kian Fan Chung, Peter J. Barnes failing to spot problematic data European Respiratory Journal 2017 49: 1602006; DOI: 10.1183/13993003.02006-2016. Too old to correct, or retract. How convenient! Scroll up to see the images. 2016 J Biol Chem retraction of 1999 paper. Same time lapse. Another golden oldie “cross-over event”, although the experiments are not quite the same. Int J Cancer. 2001 Dec 1;94(5):652-61. El-Hariry I1, Pignatelli M, Lemoine NR. Erratum: FGF‐1 and FGF‐2 regulate the expression of E‐cadherin and catenins in pancreatic adenocarcinoma. (doi). El‐Hariry I, Pignatelli M, Lemoine NR. Int J Cancer. 2001 Dec 1;94(5):652–61. There is an error in the experimental conditions reported for the data presented in Figure 4 panel B. We apologize for these circumstances, which required clarification of the data. Association of E‐cadherin with the cytoskeleton in (a) BxPc3 cells, (b) T3 M4 cells and (c) HPAF cells. after serum starvation for 24 h, cells were stimulated with either FGF‐1 or FGF‐2 (10 ng/ml) for 15 min and TX‐100‐insoluble fraction was extracted by solubilisation buffer. Lysates were immunoprecipitated with anti‐E‐cadherin antibody and subjected to SDS/PAGE and Western blotting with anti‐E‐cadherin antibody. (d) Kinetic changes in the TX‐100‐soluble (S) and ‐insoluble (I) fractions of HPAF cells after stimulation with FGF‐2 (50 ng/ml) for 30 min and 3 and 24 h. The results were analysed by densitometry and expressed graphically. The data shown in panel B were previously reported in El‐Hariry I, Pignatelli M, Lemoine NR. FGF‐1 and FGF‐2 modulate the E‐cadherin/catenin system in pancreatic adenocarcinoma cell lines. Br J Cancer. 2001 Jun 15;84(12):1656–63. The author apologizes for any confusion. Cardiff University episode 5 years ago. That means there wasn’t one until now. Surely the 2016 retraction of a 2015 Science paper, and the 2015 retraction of a 2002 J Biol Chem paper should have prompted Imperial College in establishing a data integrity committee? It is the same Imperial College. Does Imperial College have to wait for Pubpeer comments to lead to retractions? Science. 2015 May 29;348(6238):995-1001. doi: 10.1126/science.aaa7516. Epub 2015 Apr 16. Okoye I1, Wang L1, Pallmer K2, Richter K2, Ichimura T3, Haas R4, Crouse J2, Choi O1, Heathcote D1, Lovo E1, Mauro C4, Abdi R3, Oxenius A2, Rutschmann S1, Ashton-Rickardt PG5. Section of Immunobiology, Division of Inflammation and Immunology, Department of Medicine, Faculty of Medicine, Imperial College London, Exhibition Road, London SW7 2AZ, UK. Institute of Microbiology, Eidgenössische Technische Hochschule Zurich (ETHZ), Vladimir-Prelog-Weg 1-5/10, 8093 Zurich, Switzerland. Transplantation Research Center, Brigham and Women’s Hospital, Harvard Medical School, 221 Longwood Avenue, Boston, MA 02215, USA. Section of Immunobiology, Division of Inflammation and Immunology, Department of Medicine, Faculty of Medicine, Imperial College London, Exhibition Road, London SW7 2AZ, UK. Transplantation Research Center, Brigham and Women’s Hospital, Harvard Medical School, 221 Longwood Avenue, Boston, MA 02215, USA. An investigation by Imperial College into the Science Research Article “The protein LEM promotes CD8+ T cell immunity through effects on mitochondrial respiration” (1), which was the subject of an Editorial Expression of Concern in December 2015 (2), has now concluded that duplications and use of incorrect Western blots occurred during the preparation of several figures in the paper. The investigation also found that examples of the original Western blots and accompanying experimental details had been lost. The investigation found that the problematic figures had been prepared solely by corresponding author Ashton-Rickardt and he accepted full responsibility for them. In agreement with the recommendation of the investigation, Science is therefore retracting the Research Article. Pardo OE1, Arcaro A, Salerno G, Raguz S, Downward J, Seckl MJ. June 13, 2008 The Journal of Biological Chemistry 283, 16545-16553. How to explain the same FoxM1 panel for line A and line B cells? Oncogene. 2012 Apr 5;31(14):1845-58. doi: 10.1038/onc.2011.368. Epub 2011 Aug 22. FOXO3a represses VEGF expression through FOXM1-dependent and -independent mechanisms in breast cancer. Karadedou CT1, Gomes AR, Chen J, Petkovic M, Ho KK, Zwolinska AK, Feltes A, Wong SY, Chan KY, Cheung YN, Tsang JW, Brosens JJ, Khoo US, Lam EW. Department of Surgery and Cancer, Cancer Research-UK Labs, Imperial College London, Hammersmith Hospital Campus, UK. How to explain the FGF duplication for Total SKBR-3 cells and Nuclear MDA -MB-231 cells? How likely is that Oncogene. 2012 Apr 5;31(14):1845-58 will be corrected? Top row, rightmost position, Professor Eric Lam. Bottom row, middle position, Prof Justin Stebbing. Prof Justin Stebbing is one of the 2 Editors in Chief at Oncogene. “None of these issues in my opinion change the conclusions made in the papers. Oncogene never retracts anything, like many other journals. would be forced to change practice. Journals indexed in PubMed should need a quality certificate. E.g. if they don’t retract papers containing falsified data they are out. Please don’t say that we already have this with DOAJ and COPE. They are not doing anything! We should start a campain for stricter indexing and put pressure on the National Library of Medicine to change their policy. The scholarly record has turned into a giant landfil which now confuses more than to help researchers and we urgently need changes. Let’s see if Prof Alice P. Gast, President of Imperial College, cares about breast and other cancers. or does nothing and allows the problematic data to remain in the “giant landfil …confus[ing].. researchers. An editor of Nucleic Acids Research has promised not to retract Nucleic acids Research 37:3110. Nucleic Acids Research is an obstacle to science. How come Imperial College does not investigate Nucleic Acids Research 37:3110? Is that because an editor of Nucleic Acids Research has promised not to retract Nucleic acids Research 37:3110? How come the selective blind eye? Two obstacles to science, the journal Nucleic Acids Research, and the home institution, Imperial College, and your papers are as safe as house. or in insitutions which push many publications and raising of much money? Cell Death Dis. 2013 Jan 17;4:e458. doi: 10.1038/cddis.2012.197. Epigenetic status of argininosuccinate synthetase and argininosuccinate lyase modulates autophagy and cell death in glioblastoma. Syed N1, Langer J, Janczar K, Singh P, Lo Nigro C, Lattanzio L, Coley HM, Hatzimichael E, Bomalaski J, Szlosarek P, Awad M, O’Neil K, Roncaroli F, Crook T.
John Fulcher Neuro-oncology Laboratory, Division of Brain Sciences, Faculty of Medicine, Imperial College London, London, UK. Mol Cell Biol. 2004 Feb;24(3):1341-50. ASPP1 and ASPP2: common activators of p53 family members. Bergamaschi D1, Samuels Y, Jin B, Duraisingham S, Crook T, Lu X.
Ludwig Institute for Cancer Research, Imperial College School of Medicine, St. Mary’s Campus, London W2 1PG, United Kingdom. Mdm2 and mdmX prevent ASPP1 and ASPP2 from stimulating p53 without targeting p53 for degradation. Bergamaschi D1, Samuels Y, Zhong S, Lu X.
Ludwig Institute for Cancer Research, University College London, 91 Riding House Street, London W1W 7BS, UK. Cancer Cell. 2013 May 13;23(5):618-33. doi: 10.1016/j.ccr.2013.03.013. Epub 2013 Apr 25. Lu M1, Breyssens H, Salter V, Zhong S, Hu Y, Baer C, Ratnayaka I, Sullivan A, Brown NR, Endicott J, Knapp S, Kessler BM, Middleton MR, Siebold C, Jones EY, Sviderskaya EV, Cebon J, John T, Caballero OL, Goding CR, Lu X.
Ludwig Institute for Cancer Research, University of Oxford, Oxford OX3 7DQ, UK. Hepatology. 2010 Jan;51(1):142-53. doi: 10.1002/hep.23247. HEPATOBILIARY MALIGNANCIESEpigenetic Silence of Ankyrin-Repeat–Containing,SH3-Domain–Containing, and Proline-Rich-Region–Containing Protein 1 (ASPP1) andASPP2GenesPromotes Tumor Growth in Hepatitis B Virus–PositiveHepatocellular CarcinomaJian Zhao,1,2* Guobin Wu,1,3* Fangfang Bu,1* Bin Lu,1Anmin Liang,3Lei Cao,1Xin Tong,1Xin Lu,4Mengchao Wu,1, Yajun Guo, 1,2. From the1International Joint Cancer Institute & Eastern Hospital of Hepatobiliary Surgery, Second Military Medical University, Shanghai, China;2School ofPharmacy and Antibody Engineering Center of Ministry of Education, Shanghai Jiao Tong University and Shanghai Key Laboratory for Cell Engineering and Antibody,Shanghai, China;3Guangxi Cancer Hospital, Guangxi Medical University, Guangxi, China;4Ludwig Institute for Cancer Research, University of Oxford, NuffieldDepartment of Clinical Medicine, Oxford, UK. Cancer Res. 2004 Jul 15;64(14):4749-54. Ser392 phosphorylation regulates the oncogenic function of mutant p53. Yap DB1, Hsieh JK, Zhong S, Heath V, Gusterson B, Crook T, Lu X.
Ludwig Institute for Cancer Research, St. Mary’s Branch, Norfolk Place, London W2 1PG, United Kingdom. Nat Genet. 2003 Feb;33(2):162-7. Epub 2003 Jan 13.
iASPP oncoprotein is a key inhibitor of p53 conserved from worm to human. Bergamaschi D1, Samuels Y, O’Neil NJ, Trigiante G, Crook T, Hsieh JK, O’Connor DJ, Zhong S, Campargue I, Tomlinson ML, Kuwabara PE, Lu X.
Ludwig Institute for Cancer Research, Imperial College School of Medicine, St. Mary’s Campus, Norfolk Place, London, W2 1PG, UK. Nat Genet. 2006 Oct;38(10):1133-41. Epub 2006 Sep 10.
iASPP preferentially binds p53 proline-rich region and modulates apoptotic function of codon 72-polymorphic p53. Bergamaschi D1, Samuels Y, Sullivan A, Zvelebil M, Breyssens H, Bisso A, Del Sal G, Syed N, Smith P, Gasco M, Crook T, Lu X.
Haematologica. 2010 Jul;95(7):1081-9. doi: 10.3324/haematol.2009.017178 . Epub 2010 Feb 23. Bone marrow mesenchymal stromal cells non-selectively protect chronic myeloid leukemia cells from imatinib-induced apoptosis via the CXCR4/CXCL12 axis. Vianello F1, Villanova F, Tisato V, Lymperi S, Ho KK, Gomes AR, Marin D, Bonnet D, Apperley J, Lam EW, Dazzi F.
Department of Haematology, Kennedy Institute of Rheumatology, Imperial College, London, UK. They just need to apply it to Prof Lam. Cough… I saw how UCL investigated Martin Birchall. Pity I can’t publish their preliminary report. J Biol Chem. 2004 Mar 26;279(13):12005-8. Epub 2004 Jan 23. AMP-activated protein kinase plays a role in the control of food intake. Andersson U1, Filipsson K, Abbott CR, Woods A, Smith K, Bloom SR, Carling D, Small CJ. Medical Research Council Clinical Sciences Centre, Cellular Stress Group and Endocrine Unit, Imperial College London, Hammersmith Campus, Du Cane Road, London W12 ONN, United Kingdom. Triplicated data figure 3-25, page 194, PhD Thesis Jimmy Kwok Imperial College, London 2010. If you click on figure 3-25 above to enlarge you can see that the signal inside the yellow rectangles is not uniform, but does have features. A line slanting downwards towards the right in the upper part of the rectangles, and a distinct spot in the lower left of the rectangles. Figures 3-27 and 3-34, PhD Thesis Jimmy Kwok Imperial College, London 2010. Minor point: figures 3-14 and 3-15, PhD Thesis Jimmy Kwok Imperial College, London 2010, seem to contain the same information. Figure 3.1B, PhD Thesis Julie Millour, Imperial College London. Figure 3.4, PhD Thesis H R Upekha Karunarathna, Imperial College, London 2017. PhD supervisor prof Eric Lam. More similar than you might expect. Figure 5.2, PhD Thesis H R Upekha Karunarathna, Imperial College, London 2017. PhD supervisor prof Eric Lam. Figure 3-2 (lowest panel), PhD Thesis H R Upekha Karunarathna, Imperial College 2017. Figure 4.8, PhD Thesis H R Upekha Karunarathna, Imperial College 2017. Oncogenesis. 2016 Aug 15;5(8):e252. doi: 10.1038/oncsis.2016.57. RNF168 cooperates with RNF8 to mediate FOXM1 ubiquitination and degradation in breast cancer epirubicin treatment. Kongsema M1, Zona S1, Karunarathna U1, Cabrera E2, Man EP3, Yao S1, Shibakawa A1, Khoo US3, Medema RH4, Freire R2, Lam EW1. Unidad de Investigación, Hospital Universitario de Canarias, Instituto de Tecnologías Biomédicas, Ofra s/n, La Laguna, Tenerife, Spain. Department of Pathology, Li Ka Shing Faculty of Medicine, The University of Hong Kong, Hong Kong SAR, China. Division of Cell Biology, The Netherlands Cancer Institute, Amsterdam, The Netherlands. Cancer Discov. 2012 Feb;2(2):156-71. doi: 10.1158/2159-8290.CD-11-0256. The OPCML tumor suppressor functions as a cell surface repressor-adaptor, negatively regulating receptor tyrosine kinases in epithelial ovarian cancer. McKie AB1, Vaughan S, Zanini E, Okon IS, Louis L, de Sousa C, Greene MI, Wang Q, Agarwal R, Shaposhnikov D, Wong JL, Gungor H, Janczar S, El-Bahrawy M, Lam EW, Chayen NE, Gabra H.
Ovarian Cancer Action Research Centre, Division of Cancer, Imperial College London Hammersmith Campus, London, United Kingdom. 3. Single instance on image triplcation, PhD Thesis Julie Millour, 2012/13. PhD Thesis Jimmy Kwok, 2010. Figure 3-18C. Same data vertically stretched to represent different treatments (with and without drug) and different time points. Figure 3-23. Same FACS profiles, or slightly stretched FACS proflies, to represent different time points. If you click on https://imgur.com/Ibj1qiK to enlarge you can see that the signal inside the yellow rectangles is not uniform, but does have features. A line slanting downwards towards the right in the upper part of the rectangles, and a distinct spot in the lower left of the rectangles. Figures 3-27 and 3-34. Cytoplasmic becomes nuclear, and nuclear becomes cytoplasmic. Figures 3-14 and 3-15 contain the same information, the legends are the same, just number of words per line different. PhD Thesis H R Upekha Karunarathna, 2017. Figure 3.4. Same FACS profiles for different treatments and different time points. Highly problematic (two stage image manipulation). Figure 5.2. 180 degree rotation and vertical stretching. Same data used to represent different things. Figure 3.2C. Same image shifted down and across the page used to represent control samples from different cell lines. Figure 4.8. Same FACS profile for three different treatments and two different time points. Problematic, but only one instance in this thesis. Image triplication PhD Thesis Julie Millour, 2012/13. Problem is that text can be any old story, plagiarised or not. More effective would be analysis of priomary data in PhD theses. This would help put an end to the marketisation of education by the corporate state (the universities). Page 161, PhD Thesis Jimmy Kwok, Imperial College, London 2010. PhD supervisor prof Eric Lam. Upper 2 panels, figure 3.2C, page 130, PhD Thesis H R Upekha Karunarathna, Imperial College 2017. Straight edges in some parts of some lanes, but not in other lanes. Bands becoming wider above straight edge, lane 2 right panel. Resorting to “image compression” does not answer these observations. Blood. 2009 Mar 12;113(11):2498-507. doi: 10.1182/blood-2008-06-161281 . Epub 2008 Dec 3. Regulation of multiple myeloma survival and progression by CD1d. Spanoudakis E1, Hu M, Naresh K, Terpos E, Melo V, Reid A, Kotsianidis I, Abdalla S, Rahemtulla A, Karadimitris A. Department of Haematology, Imperial College Healthcare National Health Service (NHS) Trust, Hammersmith and St Mary’s Hospital, Imperial College London, London, UK. Cancer Res. 2001 Nov 1;61(21):8005-13. Direct relation between BCR-ABL tyrosine kinase activity and cyclin D2 expression in lymphoblasts. Deininger MW1, Vieira SA, Parada Y, Banerji L, Lam EW, Peters G, Mahon FX, Köhler T, Goldman JM, Melo JV. Department of Haematology, Faculty of Medicine, Imperial College of Science, Technology and Medicine, Hammersmith Hospital, London W12 0NN, United Kingdom. I used to think that Imperial College was better than UCL. I no longer believe that. Are the publisshing practices noted in this article, and the comments, one of the reasons they are coining it in? “UCL remained in second place, securing £89.2 million, up from £76.4 million.”. Problematic data figure 3.2A, page 96, PhD Thesis Vidhya Varghese, Imperial College 2016. PhD Supervisor Dr Laura Kenny, PhD co-supervisor prof Eric Lam. The influence of INK4 proteins on growth and self-renewal kinetics of hematopoietic progenitor cells. Lewis JL1, Chinswangwatanakul W, Zheng B, Marley SB, Nguyen DX, Cross NC, Banerji L, Glassford J, Thomas NS, Goldman JM, Lam EW, Gordon MY. LRF Centre for Adult Leukaemia, Department of Haematology, Imperial College School of Medicine, Hammersmith Campus, London, United Kingdom. J Biol Chem. 1999 Apr 23;274(17):12009-16. Modulation of E2F complexes during G0 to S phase transition in human primary B-lymphocytes. van der Sman J1, Thomas NS, Lam EW. Ludwig Institute for Cancer Research and Section of Virology and Cell Biology, Imperial College School of Medicine at St Mary’s, London W2 1PG, United Kingdom. Figure 5.12, PhD Thesis H R Upekha Karunarathna, Imperial College, London 2017. Figures 3-27, PhD Thesis Jimmy Kwok Imperial College, London 2010. Fuun that this does not apply to faculty. “Cheating university students face FBI-style crackdown”. Figure 3-21, page 185, PhD thesis Jimmy Kwok, Imperial College London 2010. Left untreated MCF-7 and left untreated MCF-7-CISR (different cell lines) means (black solid squares) much more similar than you would expect. DNA-PK mediates AKT activation and apoptosis inhibition in clinically acquired platinum resistance. Stronach EA1, Chen M, Maginn EN, Agarwal R, Mills GB, Wasan H, Gabra H.
Ovarian Cancer Action Research Centre, Department of Surgery and Cancer, Imperial College London, London, UK. Figure 3.2C, top right panel, PhD Thesis H R Upekha Karunarathna, Imperial College 2016. Correction. PhD thesis 2017. Replacement figure. Data mix-up between figure 8c Oncogene. 2014 Aug 21;33(34):4316-29 and PhD Thesis H R Upekha Karunarathna, Imperial College 2017? Imperial might look at home, and also as its international partners. Image duplication is the way to success. both supervised by prof Eric Lam to be revoked? PhD Theses are not set in stone. Imperial College, London, is a “Global Univeristy”, it should look to these global examples. Mol Cell Biol. 2003 Apr;23(7):2351-61. ↵*Corresponding author. Mailing address: Department of Haematological Medicine, Leukaemia Sciences Laboratories, Guy’s, King’s, and St. Thomas’ School of Medicine, Rayne Institute, 123 Coldharbour La., London SE5 9NU, United Kingdom. Mol Cell Biol. 2006 Aug;26(16):6170-84.
p27Kip1 and p130 cooperate to regulate hematopoietic cell proliferation in vivo. Soeiro I1, Mohamedali A, Romanska HM, Lea NC, Child ES, Glassford J, Orr SJ, Roberts C, Naresh KN, Lalani el-N, Mann DJ, Watson RJ, Thomas NS, Lam EW. Department of Oncology and Cancer Research UK Labs, MRC Cyclotron Building, Imperial College London, Hammersmith Hospital, Du Cane Road, London W12 0NN, United Kingdom.